The heart is a complicated organ. It has many moving parts and tubes, and is the engine that drives the body forward. But like any engine, if something happens to disrupt the functioning of that engine, there can be problems. Arrhythmia (also called dysrhythmia) is an irregular heartbeat. For some people, it doesn’t make a difference. For others, it makes all of the difference. In this article, we’ll go in-depth on arrhythmias and fill you in all of the basics that you should know. We will discuss arrhythmia causes and arrhythmia types, to arrhythmia symptoms and arrhythmia treatments. You will know everything you need to know about the basics about arrhythmias. Unfortunately, there isn’t one cause to an irregular heartbeat. There are several things that can cause arrhythmia. If you look at these causes, they are pretty varied. Some of them like smoking, drugs, and drinking are things that you can manage and are under your control. A lot of the other causes, like genetics and issues with the thyroid glands, are more or less out of your hands. There are also different types of arrhythmias that go along with the various causes of irregular heartbeats. When you are discussing arrhythmias and the different types of arrhythmias, you get into multiple types in a few different categories. Let’s start with categories; there are two of them. Tachycardia is a fast, irregular heartbeat. With tachycardia, a resting heart rate is greater than 100 beats a minute. Bradycardia is a slow, irregular heartbeat. Here, the resting heart rate is less than 60 beats a minute. Within those two main types, you have several other subtypes. Atrial flutter is a result of rapid circuits in the atrium. It is usually more organized and regular than atrial fibrillation. Atrial flutter occurs most often in people with heart disease and in those who have had heart surgery, usually within the first week. It isn’t unusual for this to convert to atrial fibrillation. Atrial fibrillation is a very common irregular heart rhythm that causes the upper chambers of the heart (the atria), to contract abnormally. VT is a rapid heart rhythm originating from the ventricles (or lower chambers) of the heart. This rapid heartbeat prevents the heart from filling with the correct amount of blood, which, of course, means there is less blood to be pumped to the rest of the body. This particular arrhythmia, especially in people with heart disease, can be dangerous and may be linked to more symptoms. Ventricular fibrillation is an erratic, disorganized firing of impulses from the ventricles. The ventricles shudder and are unable to contract or pump blood to the body. This is a medical emergency, and if it’s affecting you, someone should be performing CPR on you as you read this. PSVT is a rapid heart rate, usually with a regular rhythm, originating from above the ventricles. PSVT begins and ends suddenly. There are two main types: accessory path tachycardias and AV nodal reentrant tachycardias. This rapid heart rate is a result of an extra abnormal pathway or connection between the atria and the ventricles. The impulses travel through the extra pathways as well as through the usual route. This allows the impulses to travel around the heart very quickly, causing the heart to beat unusually fast. AVNRT is a rapid heart rate due to you having more than one pathway through the AV node. AV nodal reentrant tachycardia can cause heart palpitations, fainting, or heart failure. These are slow heart rhythms, which may be caused by a disease in the heart’s electrical conduction system. Slow heart rhythm due to an abnormal SA (sinus) node. 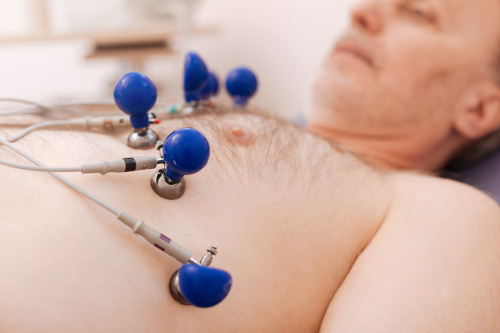 A pacemaker is used to treat sinus node dysfunction. A heart block is a delay or complete block of the electrical impulse as it travels from the sinus node to the ventricles of the heart. It can be treated with a pacemaker. One of the most important things about heart arrhythmias is recognizing them before the possible damage becomes too bad and can’t be repaired. If you are suffering from a few of these symptoms, it would be a good idea to seek medical attention to check it out. Several of these symptoms are linked to other less threatening issues, but it’s better to be safe than sorry. A pacemaker is a small implantable device that helps control abnormal heart rhythms. The pacemaker is placed under the skin near the collarbone, and an insulated wire extends from the pacemaker to the heart. If a pacemaker detects a heart rate that’s abnormal, it emits electrical impulses sent down the wire to the heart that stimulates your heart to beat at a normal rate. An ICD is a battery-powered unit that is implanted under the skin near the collarbone. One or more electrode-tipped wires from the ICD run through veins to the heart. The ICD continuously monitors your heart rhythm. If it detects an abnormal heart rhythm, it sends out an electric shock to reset the heart to a normal rhythm. An ICD doesn’t prevent an abnormal heart rhythm from occurring, but it can help the heart go back to normal when one occurs. In terms of other medical treatments, there are a variety of treatments that a doctor may suggest. You may be prescribed medication to control your heart rate or restore a normal heart rhythm. In order to prevent issues and side effects, it’s best if the medication is taken as directed. There are some movements that may be able to stop an arrhythmia that begins above the lower half of your heart (supraventricular tachycardia). These movements may include holding your breath and straining, dunking your face in ice water, or coughing. Certain types of arrhythmias, such as atrial fibrillation, can be controlled with the use cardioversion. A shock is delivered to your heart through paddles or patches on your chest. The idea is that the electrical current affects the electrical impulses in your heart and can restore a normal heartbeat. The doctor threads one or more catheters through your blood vessels to your heart. Electrodes at the catheter tips can use heat, extreme cold or radiofrequency energy to damage (ablate) a small spot of heart tissue and create an electrical block along the pathway that’s causing your arrhythmia. Get Your Heart Checked Out! Heart arrhythmias can be normal and easily treated and others, without medical treatment, can lead to some very bad things happening to you. If you feel that you are at risk of arrhythmia or that you have a symptom or two, get yourself checked out. In this case, it’s much better if you start treatment as soon as possible, so that damage to your heart doesn’t happen or, is at least, limited. “Heart Disease and Abnormal Heart Rhythm (Arrhythmia),” Medicne Net, August 16, 2016; http://www.medicinenet.com/arrhythmia_irregular_heartbeat/article.htm. “Heart Arrhythmia,” Mayo Clinic, February 23, 2016; http://www.mayoclinic.org/diseases-conditions/heart-arrhythmia/diagnosis-treatment/diagnosis/dxc-20188380. “When Your Heart Rhythm Isn’t Normal,” WebMD, April 21, 2015; http://www.webmd.com/heart-disease/guide/heart-disease-abnormal-heart-rhythm#1. “Types of Arrhythmia,” National Heart, Lung, Blood Institute, July 1, 2011; https://www.nhlbi.nih.gov/health/health-topics/topics/arr/types. “Symptoms, Diagnosis & Monitoring of Arrhythmia,” American Heart Association, September 19, 2016; http://www.heart.org/HEARTORG/Conditions/Arrhythmia/SymptomsDiagnosisMonitoringofArrhythmia/Symptoms-Diagnosis-Monitoring-of-Arrhythmia_UCM_002025_Article.jsp#.WPnhgFPytol.